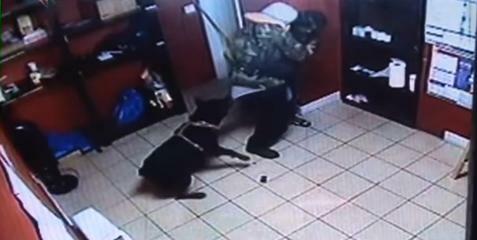 Rottweiler helps owner to disarm robber of a Jewlery Store ! His Rottweiler dog named 'Capone' helped him disarm a robber that was planning to rob the shop. The robber dentified by police as Hakim Salone, 34, struggled with Richard Salgado, the Empire Jewelry & Loan employee, was trying to take the gun from the robber for more than 6 minutes, everything recorded from the shop's security cameras. p;The shop's guard dog, Rottweiler Capone rushed to help the employee as soon as he saw that something wasn't going on well. The dog went on to bite the robbers clothes and managed to rip away a piece of the robbery suspects shirt and then got hold of his pant leg.